You’ve just stepped off a nicely air conditioned train into the thick, warm, Bangkok air. It’s dark, it’s very quiet (this isn’t exactly in the middle of the tourist hub), and you’re not really sure where you should be going. 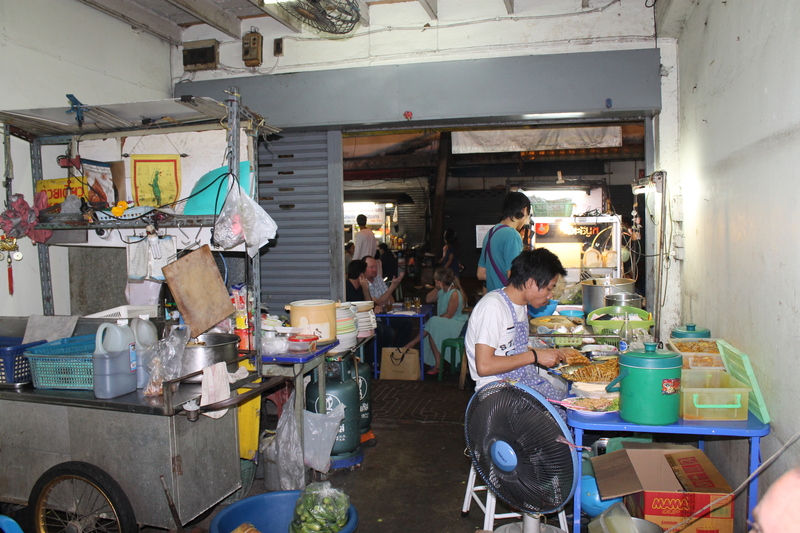 You follow your map to the little street marked “Soi 38,” and you know you’ve arrived when the sudden burst of colour, sound, smells, movement and utter insanity hit you! 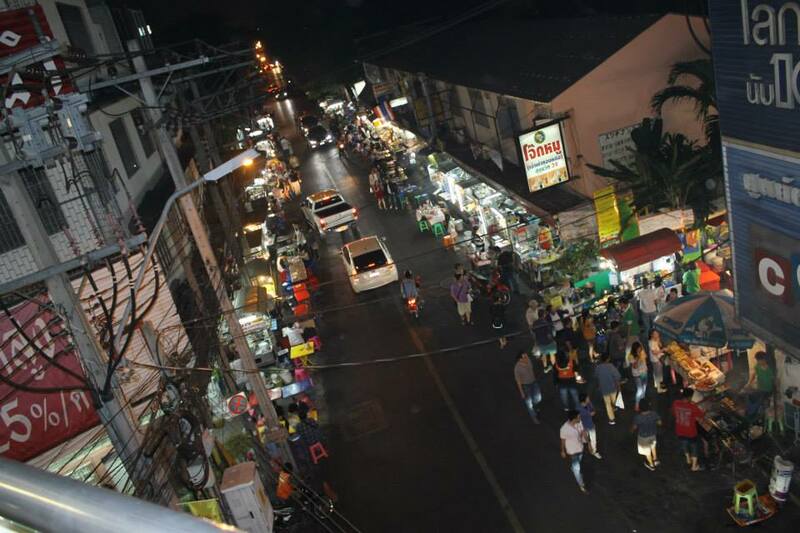 Although when we visited it was no where near as busy as it regularly is, due to the Bangkok Shut Down movement, it was still incredible. Little plastic tables with those adorable little plastic stools that so many of us associate exclusively with Asian street food ran the length of the street, and barely a single one without a bum on it. Whether they were set up in front of permanent stalls or little carts with gas burners temporarily propped up along side didn’t matter in the slightest – they were all absolutely packed with both locals and the few tourists who were brave enough to leave their hotels in the middle of a delicate time politically (a day before we arrived, an unarmed bystander was apparently shot not far from our hotel) – we’re not the type to wait anything out, so we threw ourselves right into the centre of it! It was impossible to place the smells you were taking in – just as you thought you’d identified a whiff of ginger, your nose was smacked with a smell of seafood… or were your eyes watering a little because of the spice in the air? Did you just smell coconut? Or was that mango? The sounds: yelling of orders, laughing of friends over food, sizzling of hot plates coming out. It’s magical! 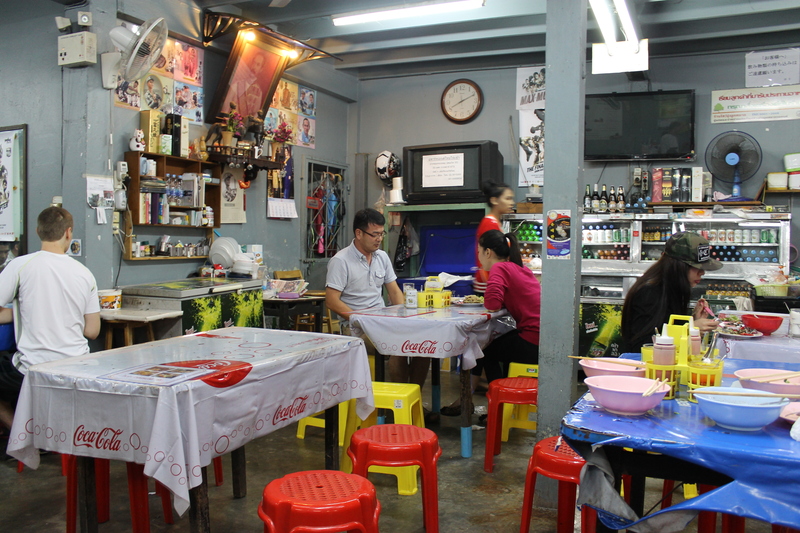 After walking the length of the street to suss out our options, we stopped at this little place – partially because I recognised their menu was basically all pork, partially because a few tables had just opened up as we were walking past. We ran in and jumped on two stools as a stream of people came in behind us. This adorable little guy was running his place like an absolute boss! The space was actually shared by three separate “restaurants,” and he made it his business to run around each and every table, pushing his food above the others (not hard, because no one else was making even a quarter of the effort he was), smiling at everyone, laughing like a kid, and making sure everyone knew what was on the menu. When it came time to order, I told him no need for a menu – just bring us whatever your favourite dish is! Could have been risky, I know, but when in Rome… This guy must have been doing this for the best part of his life, he clearly knows what’s good, and how on earth else can you possibly experience another culture without asking advice from a local?! You’ll get some handy hints from your guidebook, sure, but you can’t buy in book form experience! 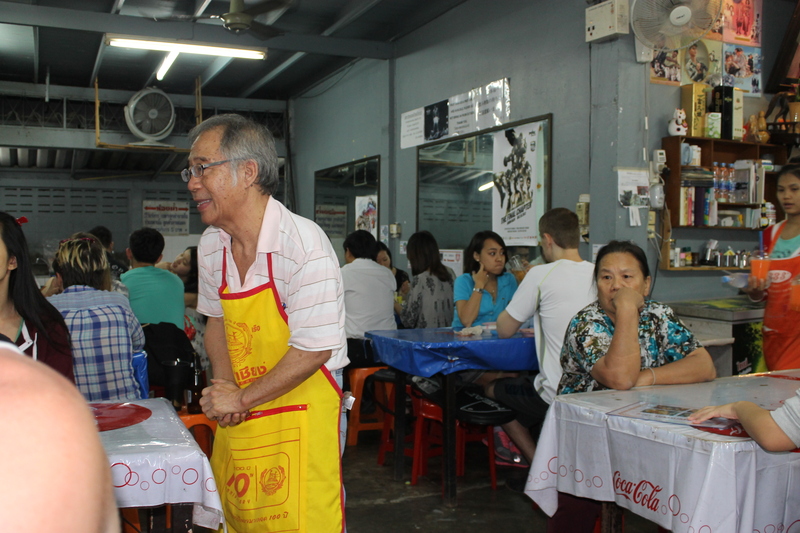 I tell ya what, that experience has really opened me up to this style of dining in foreign places from now on – he nailed it! 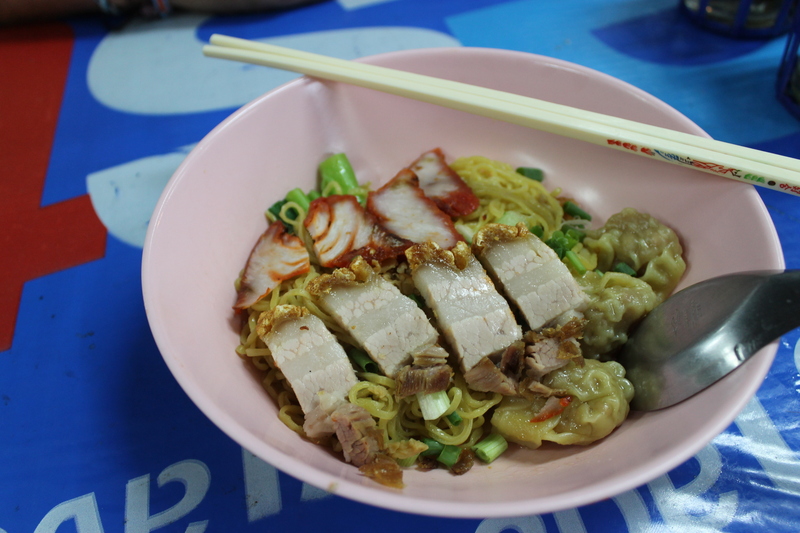 Noodles with pork 3 ways – won tons, BBQ pork and crispy pork belly. It was bloody magnificent and wouldn’t have cost any more than AUD$4.00, which is absurd. If I hadn’t asked for his recommendation, there’s no way I’d have known to order something like this – the foreign menu which I couldn’t read probably would have daunted me and I’d have looked for the most boring and plain thing on there. That is NOT the way to travel! 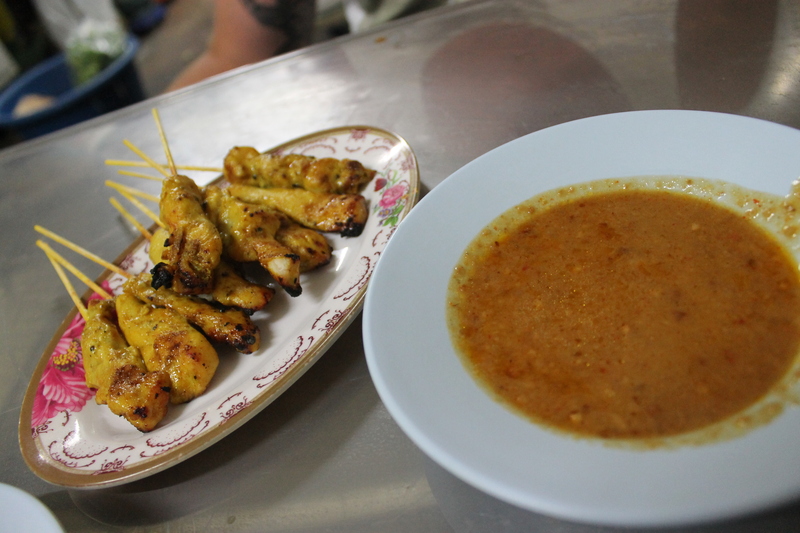 Encouraged after that win, we ventured on down the street until something caught husband’s eye – 10 chicken skewers with home made satay sauce for 80 baht. That’s around AUD$2.50, and it was way too good to pass up. We ordered a plate, and the lady running the show was so excited to have some visitors that weren’t either locals or there with a local, that she ushered us past her coals and cooking chicken, and into the back of her little store front, where her sons were working away threading more meat onto skewers. I took the picture below from the table she hastily set up for us, wondering what on earth we’d gotten ourselves into. She smiled at us the whole time, even brought out a little bowl of salad (lettuce, tomato, cucumber and chillies) while fresh skewers cooked away for us. She ladled a large spoon of her home made satay sauce into a bowl, rushed back to the chicken, and proudly presented them to us, with another big smile. Some times food truly is a universal language; even if you can’t understand each others’ words, we all understand the care taken to prepare a meal and the appreciation and enjoyment of it. These were probably the best satay chicken skewers I’ve ever had. They were made using the absolute freshest chicken, which was evident when it didn’t take much effort to bite into them and reveal the soft, white meat under the caramelised shell. The sauce was magnificent too. I was grateful that I’d remembered the Thai word for “thank you,” because never had it felt so appropriate to use as then. She could have easily given us our meal on a paper plate and sent us on our way, but she took the time and care and effort to make us feel at home, and that’s exactly how it did feel – no fancy restaurant, it felt like home. 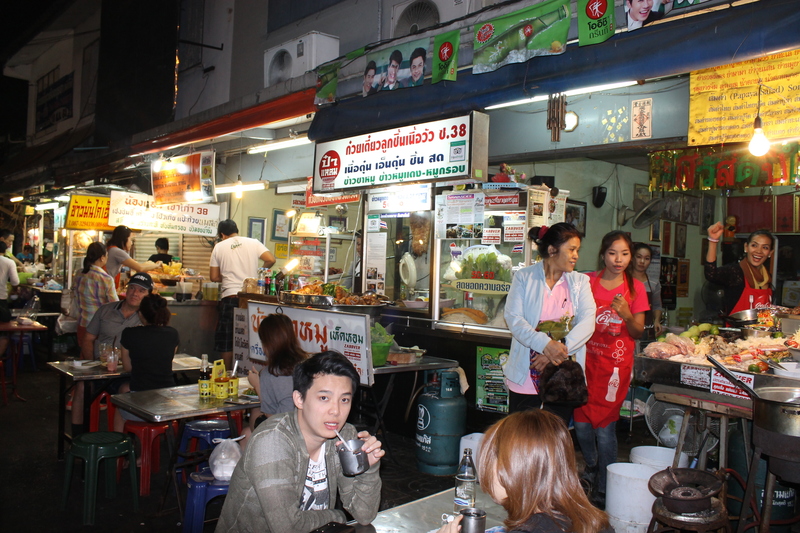 So, there we sat, in the back of a chicken skewer stall, taking it all in – the smells, the noises, the atmosphere… it was one of the best nights I’ve ever had! After the chicken, it was down with another plate of coconut sticky rice with fresh mango (dead set, I ate my weight in this stuff), and back to the train to take us home.